Bitcoin Mogul is supposed to be a trading robot for Bitcoin and altcoins. It will trade automatically for you and allegedly make you money, thousands of dollars per day. The software is free, so can you really become rich fast with Bitcoin Mogul? As you might have noticed, Bitcoin Mogul uses materials that are branded with the Bitcoin Loophole, which is a scam. And yes. Bitcoin Mogul is just clone of that scam, it brings nothing new, it uses the same video. 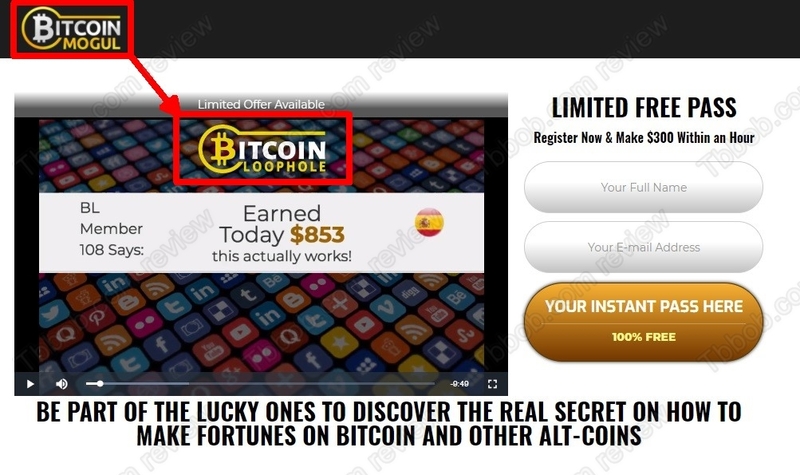 You can see our review of Bitcoin Loophole for proofs that it is a scam. In fact, this chain of scams is even longer, it goes back to Bitcoin Code, all the following ones are just copies. All positive reviews and testimonials about Bitcoin Mogul that you will find are fake, this system is losing money, we know it from real users. It has nothing to do with real cryptocurrency trading, it is just a tool to take money away from you. Now let us explain how scammers make money in this. When you sign up for Bitcoin Mogul, they will redirect you to an unregulated broker called eMarketsTrade and push you to deposit money. This is because they are getting paid by this broker for referring new depositors. That’s all. This is why they made up their story about a profitable system, they need you to deposit money with their shady broker to earn a commission. Bitcoin Mogul is a scam that can only lose you money with a non-regulated broker. Stay away from it! If you want to trade cryptocurrencies and try to make money, start on a free demo with a regulated broker. You will have to understand all the risks and build a solid strategy before potentially investing real money.